Octaciano (Chano) was 22 years old when he became a GOJoven fellow. 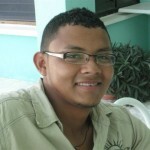 He was a very dedicated and creative young leader from the town of Tocoa on the Atlantic coast of Honduras. Chano’s educational background included Business Administration and Management and Social Development. He actively participated in numerous social projects in Tocoa, including a student environmental group organized by the International Municipal Environmentalists, and designing and implementing a housing program for the elderly, and working with Medicos del Mundo (World Doctors). His work as an environmental leader inspired him to work with other young people in Sexual and Reproductive Health issues, particularly in HIV prevention. From 2013 onward, he was a co-founder and active member of the GOJoven Honduras Association, alongside dozens of his fellow GOJoven Alumni. Chano passed away in June 2018. GOJoven honors his memory and his tireless work and commitment to improve the health and livelihood of populations in his community with limited opportunities, including the Garifuna population, women, young people and children. Posted in featuredfellow, Honduras 2009.